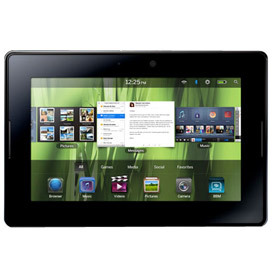 Compare 2 Blackberry PlayBook sim free/unlocked mobile phone deals. BlackBerry enter the market with their exceptionally designed BlackBerry PlayBook featuring the built from the ground up BlackBerry Tablet OS. Housed in a sleek, slim and glossy casing the tablet uses the smaller 7" screen format and is powered with a 1GHz processor and 1GB RAM. The 7" LCD screen has a resolution similar to the iPad and a Netbook at 1024 x 600 and incorporates 4 finger multi touch gestures. There is also GPS capabilities, a front and back facing cameras, with 1080p HD video and video conferencing. There is also WiFi, Bluetooth and 3G connectivity. The BlackBerry Tablet OS supports multitasking as well as seamless integration with a BlackBerry smartphone and built in out-of-the box for BlackBerry Enterprise Server making it an excellent choice for business users. It also supports both Flash and HTML 5 for the ultimate web and online experience. No one has yet rated the Blackberry PlayBook. Click the link above and score it out of 5 based on how awesome you think it is. You can also leave a few comments or write your own review.